Move mover Monopoly the board game as we know it has been changed. Meet the next generation of board games, The GameChanger. You already know how much you can do with your iPad and now you can get the whole family involved. The GameChanger is a dock that you fit your iPad into, then the fun begins. With the fold out play mat you move pieces like you would on an old-fashioned board came. So the next logical questions are what games will I get and how much will it cost? Four game skins and pieces come with GameChanger ,The Magic School Bus and Animal Mania,turns the iPad into the ultimate family gaming experience. Kids 6 and up are ideal candidates to have fun and the price is $79.99, so naturally The GameChanger will make a great Christmas gift for the family. With The GameChanger come a free app which you can access and select the games. According to a Press Release from Identity Games you can pick up the hardware at retailers including Toys”R”Us, Apple Stores and Amazon.com. And that’s not all the Identity Games group added that additional games will soon be available, including Kaboom and DuckDuckGoose. Check out the Amazon link below the pic to pick up The GameChanger today! 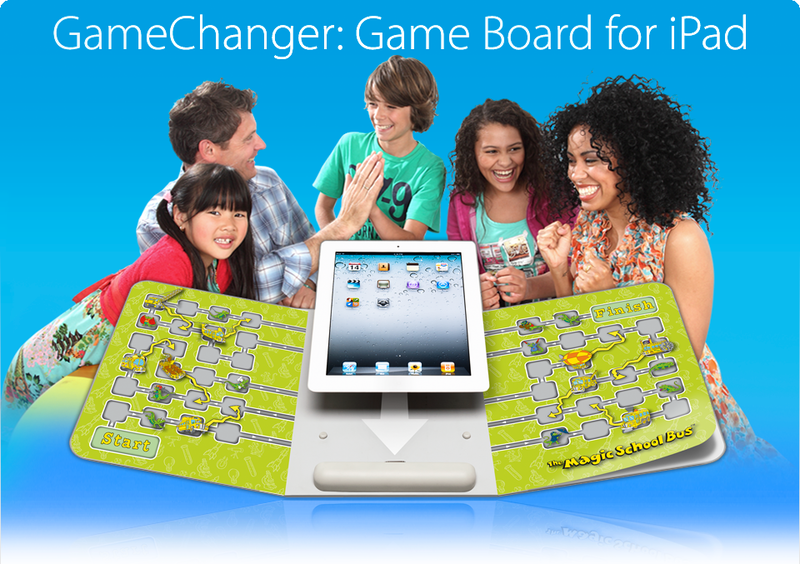 Here is a little more info on the free games with The GameChanger via the iTunes app store. Animal Mania is all about the animals in the world. From the bottom of the ocean to the heart of the jungle and even a little animal history. Trivia questions, fun tasks and entertaining riddles, fun for the entire family no doubt. The Magic School Bus. This game is a cult classic. By joining Ms. Frizzle and her class you’ll learn about space, the planet and the human body. Interactive trivia and educational mini games combined with videos from the popular animated series is sure to equal hours of fun. For additional information, visit www.boardgamechanger.com.